My article on the Dalai Lama's visit to Taiwan is available on Rediff.com website. Click here. Why is the Army always denying or minimizing incidents of Chinese incursions into the Indian territory? Why does the Naval Chief need to comment on this? Has the Sea reached Gangtok or Nathu-la? One point is sure, the Chinese will continue to intrude as long as the Indian Army does not take a firmer position or play the same game. Leh (J&K): Two Chinese helicopters have reportedly violated the Indian air space in recent months in Leh area of north Jammu and Kashmir during which they air-dropped some canned food in barren land at Chumar, northeast of this Himalayan town, along the border. 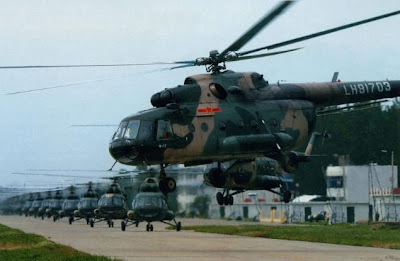 The MI series helicopters were reported to the nearby defence post by residents of this high altitude area living along the Pangong lake, located in the lap of majestic hills, prompting the Army Aviation Corps to rush its Cheetah and Chetak helicopters. 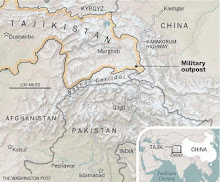 However, they could only find tell-tale signs left by Chinese helicopters which hovered in the Indian territory for nearly five minutes dropping the food material on June 21 this year, sources said. A confidential defence document accessed by PTI shows that Chinese helicopters entered into Indian air space along Damchok area and Trig Heights in Ladakh and air dropped canned food containing frozen pork and brinjal, which had passed the expiry date. INDIA CHINA TRADE ROUTE: A snow-covered Indian army camp is seen at Nathu-La, 55 km north of Gangtok. New Delhi: Was there a border face-off between Indian and Chinese troops at Nathu-la, Sikkim? The Indian Army has denied reports of any face-off in sections of the media. The Army has also denied reports of a Chinese intrusion and has refuted rumours of an Indian troop build up. The Army says sections of National Highway 1 have not been closed down to facilitate troop movement, but that the highway is blocked because of landslides. 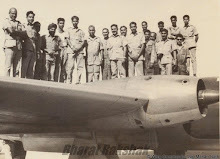 Nathu-La, at a height of more than 14,000 feet, last saw action in 1962. It reopened to border trade only two years ago. So-called intrusions are common along the disputed border by both sides who try and keep alive respective territorial claims, but the border has been largely peaceful since the 1990s. Meanwhile, Chief of Naval Staff, Admiral Suresh Mehta, has denied reports of Chinese incursions into Indian territory on the Northeastern border. "I don't know where you have heard that story from," he said when asked about troop movements and any intrusions. The Chinese sent a probe about an Indian Consulate to be opened in Lhasa. It was denied by the MEA and later by the spokesman of the Chinese Foreign Ministry. What was the point in sending this probe? It was recently reported that traders using the centuries-trade route crossing into Tibet at Lipulekh-la have only imported Rs 73000 worth of goods this year. The business over Nathu-la is not flourishing either (Rs. 9 lakhs in July after two months lull). Then what is the point to open a Consulate in Lhasa? The pilgrims to Kailash-Manasarovar do not need a Consulate to reach the holy mountain. Beijing probably wants to 'balance' the negative reports in the press about the deterioration of the bilateral relations with Delhi. Is there anything else? The future will tell us. 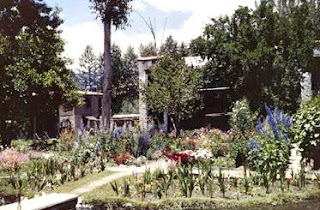 I am told that the Dekyi Linkga (on the pictures), the former residence of the British (and then Indian after 1947) heads of the Indian Mission in Tibet still exists and is used by the Army or the paramilitary force. 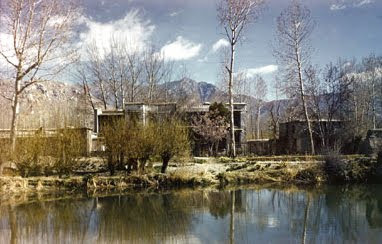 It was one of the most beautiful residences of the Tibetan capital with lovely gardens. 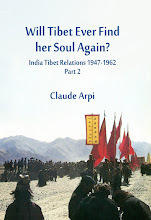 LHASA: More than 40 years after bad blood between India and China closed down the Indian consulate in Tibetan capital Lhasa, a Chinese foreign ministry official says New Delhi can re-open it any time it wants. "India can set up a consulate in Lhasa," said Jujian Hua, director at Tibet's Foreign Affairs Office. "That depends on India." With the 13th round of border talks between India and China resuming in New Delhi earlier this month, Beijing is emphasizing that it wants improved relations with its southern neighbour. "The (resumption of) cross-border talks between China and India represents a great step in the relationship between the two countries," Jujian told a visiting IANS correspondent. "The two governments started communication several years ago in terms of trade and culture. The local government (of Tibet) has attached great importance to trade, culture and tradition (exchanges), including tourism." According to him, tourism has greatly increased with more than 12,000 Indian pilgrims visiting Tibet this year to circumambulate Mt Kailash, the 6,638m Himalayan peak in Tibet's Nari province that is venerated by Hindus, Buddhists and Jains alike. "Deepening the bilateral relationship really depends on India," the official said. "Between friends, we should communicate more so that our relationship is strengthened. The central government of China and the Tibet Autonomous Region have a very positive attitude." However, the official rued that New Delhi has several times refused visa to Chinese delegates. "Several trade and cultural delegations (headed for India) didn't get visas," he said. According to him, even a month ago, a trade delegation headed by the vice-governor of Tibet was refused visa by the Indian authorities. Though officials stop short of spelling it out, the major irritant in India-China ties is the presence of the Dalai Lama and his 'government-in-exile' in India's Dharamsala town. China officially calls the exiled former ruler of Tibet a separatist and his 'government' illegal and it is clear that exchanges between the two governments could improve remarkably if India closes down the 'government-in-exile', just as Nepal closed the office of the Dalai Lama's envoy in Kathmandu four years ago. "The 'government-in-exile' is not in line with international laws," says Angpu Gejyuan, vice-director of the Religion and Nationalities Committee. "No government admits such exiled governments. China and India are two ancient civilisations. We want the Indian government to do that which benefits the relationship and friendship between the two countries." 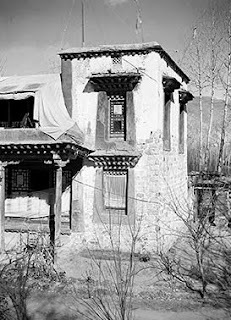 The Indian consulate in Lhasa was closed following the tumult in Tibet beginning from the 1950s after China annexed the former Buddhist kingdom and the 14th Dalai Lama fled to India following a failed uprising in 1959. Three years later, China attacked India and the Indian consulate in Lhasa was closed. At present, Nepal is the only country to be allowed a consulate in Lhasa, the Forbidden City. Though there have been rapid changes in Nepal's own political scenario, its successive governments, though diverse, have upheld the same foreign policy that considers Tibet, along with Taiwan, to be an integral and inalienable part of China. 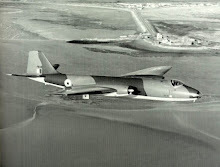 As memories of the 1962 war faded, India was allowed to open a consulate in Shanghai last year besides the embassy in Beijing, and then Indian External Affairs Minister Pranab Mukherjee inaugurated a second consulate at Guangzhou, a diplomatic concession for which India in turn gave China permission to re-open the Chinese Consulate in Kolkata that had been closed after the 1962 war. Besides India, the US is also seeking to open a consulate in Lhasa. In May, the Foreign Affairs Committee at the US House of Representatives passed a bill authorising the Secretary of State to establish a consulate in Lhasa. US President Barack Obama will visit China in November when he is expected to push for the new consulate. BEIJING: The Indian government has not approached Chinese authorities for permission to open a consulate in Lhasa, the regional capital of Tibet region, a government official clarified. He was reacting to a news agency report indicating that China was ready to allow India to set up a consulate in Lhasa. The report quoted a director in Tibet's foreign office saying that India can set up a consulate in Lhasa. When contacted, the Indian official clarified there was no question of China discussing this issue as New Delhi has not presented any plans to open a consulate in the Tibetan capital. Nepal is the only country, which has been permitted to establish a consulate in Lhasa. The government of Nepal plays an important role in helping China to curb the flow of Tibetan refugees to India through the Nepalese route. India had a consulate in Lhasa in the early sixties after the escape of the 14th Dalai Lama to India. Chinese authorities keep a close watch on the movement of foreigners in Tibet because it continues to be politically sensitive. 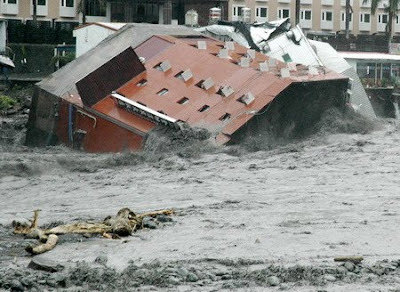 Several western nations keep a close watch over the situation in Tibet although they do not have any official presence. China yesterday dismissed the reported setup of an Indian consulate in Lhasa, the capital city of Tibet Autonomous region, adding that the city is not being considered for a foreign consulate. Asked by the Global Times to confirm the report of Indian media that India can reopen a consulate in Lhasa any time, China’s Foreign Ministry spokeswoman Jiang Yu said the Chinese government, as always, welcomes the establishment of foreign consulate units in China to promote bilateral relations. But China has not yet approved any consulate settlement in Tibet since it doesn’t meet the conditions for a foreign consulate now. The Dalai Lama, the spiritual head of the Tibetans will travel directly from the mountains of Ladakh, where he was giving Buddhist teachings to local people and Tibetans since 2 weeks, to another Buddhist region, the Republic of China, as Taiwan is known. The official reason for the visit is to pray for the victims of the typhoon Morakot which hit the coasts of Taiwan on August 8 and claimed some 700 lives. 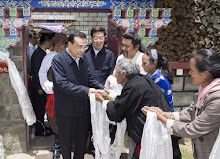 The leaders of seven municipalities touched by Morakot (all belonging to the opposition DPP or Democratic Progressive Party) invited the Tibetan leader to visit the island to console the survivors and pray for the souls of the departed. Their invitation has put President Ma Ying-jeou in a tight spot, especially after he was heavily criticized for his poor handling of the aftermath of the deadly storm. Ma’s problem is that he had made it a priority for his government to establish more convivial relations with the other side of the Taiwan Strait; the visit of the Buddhist leader comes truly at a wrong time. However, he had little choice but to accept to the proposed visit in view of his extremely low ratings in opinion polls (below 20%). Probably against his better convictions, Ma had to declare: “The Dalai Lama could come to Taiwan to help rest the souls of the dead and also pray for the well-being of the survivors." The Dalai Lama already visited the island in March 1997 and April 2001 during the DPP’s rule when a more independent policy towards the Mainland was advocated. A few days before his first visit to Taipei in 1997, I had the privilege to interview the Tibetan leader. At that time, he had spoken about his motivations: “My main purpose is to show to every Chinese that we are not anti-Chinese. This is Number One.” He added: “This is a signal for the Chinese communists in Beijing.” His main argument was: “Our image [with the Chinese people] will improve; the impression of millions of overseas Chinese and eventually in the Chinese Mainland will be different.” He thought that ordinary Chinese would then realize that he was able to have friendly relations with Chinese people. 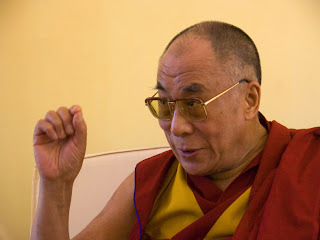 In November 2008, the Dalai Lama called for a General Meeting to assertain the opinion of the Tibetans on the future of the negotiations with Beijing (which had not really taken off). 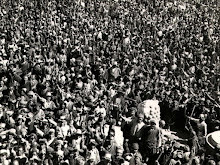 At that time a majority said they were ready to follow the Tibetan leader in his Middle-Path approach. It however appears that the Dalai Lama now tries another strategy: as the present authoritarian regime in Beijing has not shown any signs ‘understanding and far-sightedness’, as he put it after the July incidents in Xinjiang, he has begun to enlarge his personal contacts with the people of China. The bloody incidents in Urumqi have probably strengthened the Tibetan leader’ opinion that it was the right way for the present. The Dalai Lama has repeatedly made his point: he has no problem with the people of China; the difficulties are only with the present regime. However as long as the Chinese Communist Party remains in power in the Forbidden City, nothing seems able to move forward, whether it is in Tibet, in Xinjiang or in China. It is not that the Beijing bosses are not trying to change their poor image. At the end of his recent four-day tour of Xinjiang, President Hu Jintao declared that a directive has been issued by his government “to make studies in ethnic harmony compulsory for high school students sitting the national college entrance exams”. But for the local ‘minorities’ or ‘nationalities’, it is only one more gimmick as it does not translate into more autonomy for the regions. Vice-President Xi Jinping and Vice-Premier Li Keqiang also went on tour in two other ‘minority’ regions, the Inner Mongolia Autonomous Region and the Qinghai province respectively. During his trip to Inner Mongolia, Mr Xi asked the local cadres to promote education on patriotism. Does he realize that for the ‘minorities’, patriotism has no meaning? Despite these professions of faith from Beijing, the problem may remain as long as the Party keeps its firm grip on the ‘nationalities’ affairs. The only foreseeable change is a change inside China. Interestingly, a report prepared by a Chinese think-tank, Open Constitution Initiative or Beijing Gongmeng Consulting on the 2008 riots in Tibet is an eye-opener. It entirely contradicts the Party’s official version. The authors are lawyers “committed to building a modernized China and promoting human rights, democracy, and rule of law in China." In Ladakh, the Dalai Lama said that he had heard about 680 articles and essays in Chinese language on the Internet supporting the Tibetan people, and often criticizing the Chinese government’s policies in Tibet. The problem is that Hu and his colleagues’ speeches on ‘ethic harmony’ do not translate into reality. For example Xu Zhiyong, one of the founders of the Beijing Gongmeng has been arrested in early August and though he has since then been released on ‘bail’, he will probably not be able to continue to do his work on human rights and other ‘hot’ topics such as Tibet. He is under official ‘surveillance’. The Dalai Lama is right to reach out to ‘ordinary Chinese’; in the long run, it could only pay rich dividends, but the results won’t probably be seen in the immediate future. My article on the Partition has been published by Sify.com.